A little bit ago, I started seeing some chatter on Instagram about this new company called Hex Nail Jewelry. I was intrigued and went to go check out their shop. Immediately enamored with their reusable 3D gold plated nail charms, I got in touch with Brenda and Melissa, the two sisters behind Hex. I asked them if they would be interested in partnering up with Chalkboard Nails for a giveaway, and luckily they agreed! But we'll get to that at the end. Let's take a look at what I created with some of Hex's charms! This was the first look that I created. I had just received my bottle of Nails Inc Noho, a black leather polish, so I clearly had to incorporate it into the manicure too! The sexiness of the leather called for the addition of red, so I grabbed American Apparel Downtown LA. BUT I DIDN'T STOP THERE! I also added a coat of Wet N Wild Tonight's Gonna Be a Good Night to the red nails, tying them in with the black. 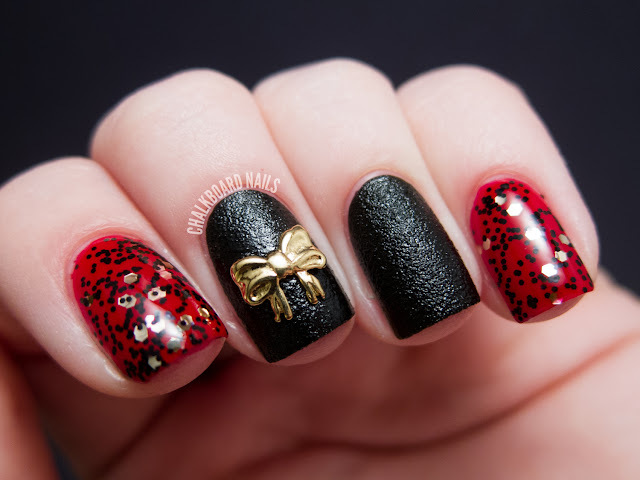 The finishing touch was the Hex Nail Jewelry Bow Charm. They offer two sizes of bow charms -- this is the larger one. I attached it with nail glue and it added just the right amount of sweetness to the sexiness. This magical manicure has only three components! 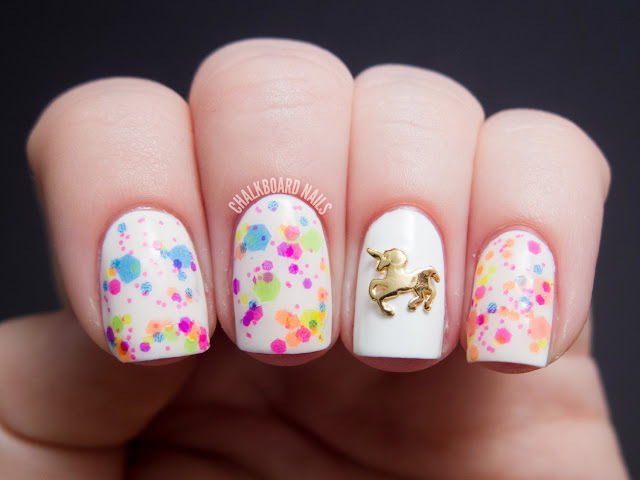 The white base is Cult Nails Tempest, the awesome neon glitter topper is Lush Lacquer Clowning Around, and the star of the show is the prancing unicorn charm from Hex Nail Jewelry. I mean... cmon. It's a unicorn, and it's prancing. You can't not love that. This third look made me feel RICH! I began with a base of OPI My Vampire is Buff and watercolored OPI Jade Is the New Black on top of it. 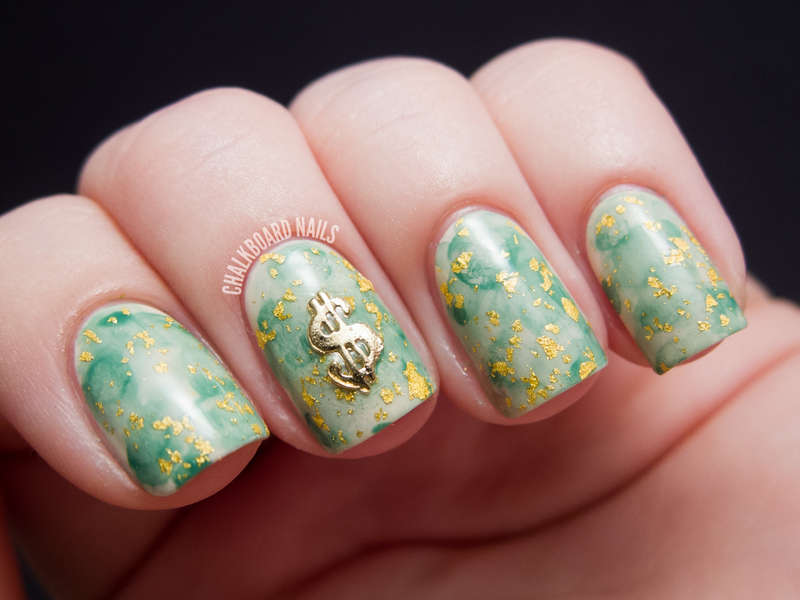 I thought the linen shade and the money green would represent dollar bills well! Then, I added a coat of Cirque Au, my favorite gold leaf topcoat, because what's a manicure about money if you don't include a little gold? The Hex Nail Jewelry Money Charm was the final touch that tied it all together. 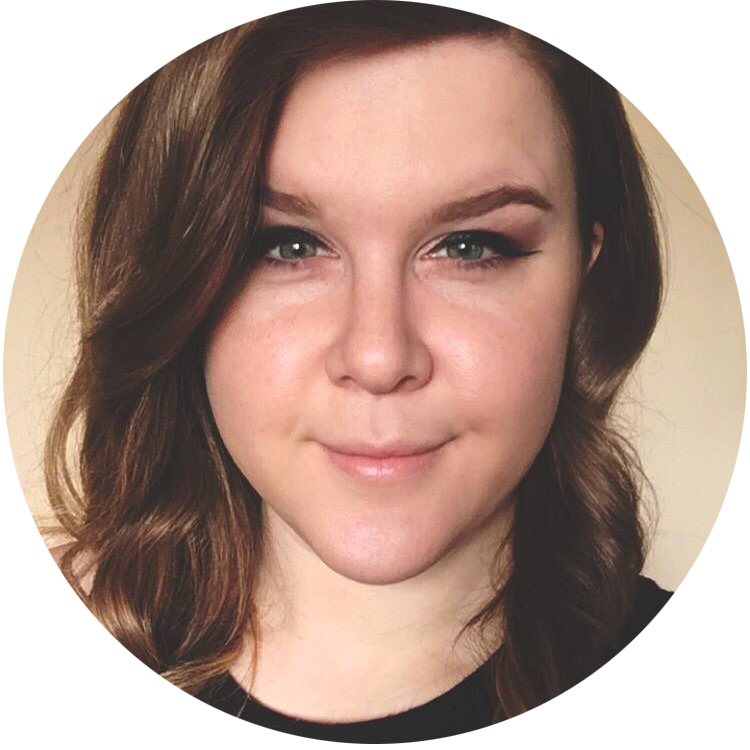 I'm sure you guys have questions, I know I did! Let's tackle some. How do these sit on a nail? Hex Nail Jewelry charms come curved. The curve allows them to stick to your nail better and minimizes the chances that they will snag on something. Of course, certain charms may work differently for different people depending on their specific nails and the size of the charm. Some of the charms I tried sat perfectly on my nail while some of the larger ones didn't sit completely flat along the edges. They were still wearable either way! Are you supposed to topcoat them? That's really up to you. As you can see, I didn't add topcoat to my looks so you could get a better look at the charms themselves. I tried applying topcoat to a few charms, and they still looked totally fine. Obviously adding a layer of topcoat will help the charms stay on longer, too! How do you attach them? I attached my charms to completely dry nails with nail glue. If you anchor them to the nail with just topcoat, they may detach faster. You can even include these in your gel manicures to enjoy them for weeks at a time! Yes! These are completely reusable. Hex recommends that you soak the charm in hot water to dissolve the glue and remove it. If you need to take off a top layer of topcoat, be aware that acetone will make the gold plating on the charms wear down more quickly. How long do they stay attached? It depends. There are a number of factors that can influence how long they last: nail curve, polish underneath, method of attachment, topcoat... Currently I'm wearing a charm that I attached with nail glue and finished with topcoat, and it seriously feels solid as a rock. Where can I purchase them/get more info? Hex Nail Jewelry charms are available at www.hexnailjewelry.com. From a teddy bear to a starfish to a charm that says 'foxy,' there is bound to be something for everyone. You can also keep up with the brand on Facebook and Instagram. Products sent for review. Post contains affiliate links. Now -- on to the giveaway! The ladies over at Hex Nail Jewelry have generously provided me with a set of five of their Love Struck charms to give away to you guys. Please enter using the Rafflecopter widget below. Must be a follower of Chalkboard Nails to win. Must be 18 years of age or older, or you must have your parent's permission to enter. This giveaway is open internationally, and closes on 3/13/2013. The winner will have 48 hours after being contacted to claim their prize, after which a new winner will be chosen. These are DIVINE! Can't wait to order some! All of these look awesome! These are so affordable! I just ordered 6 of them. Love the designs you came up with- especially the first and the last one! Ohhh I really really like these! 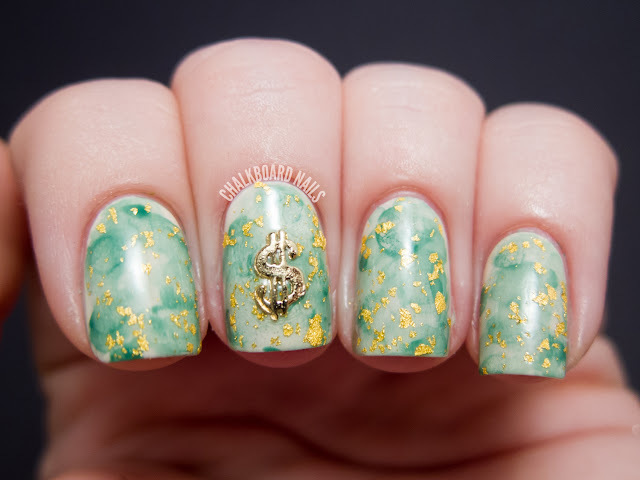 All of the manis are so creative and the jewelry is very gorgeous! I think I need to get some of these! all the manicures you created are absolutely gorgeous! I can't even pick a favorite! Wonderful GA, thank you for this opportunity! All of these manicures are stunning - wow!! Thank you so much for introducing me to Hex Nail Jewelry - a new reason to spend all my money over at Etsy!! As for the polishes, I love the Lush Lacquer neon topper, as well as Cirque Au, but is nothing new. I have been lemming Au for awhile now, but it's simply too expensive for my budget. I just went and bought a bunch... SO CUTE!!! I wish I had read your whole post before I went to buy them, that unicorn mani is super cute!!! I love the unicorn in mid-prance! that unicorn nail art is a stunner! Wow, all three looks are amazing, but the first one is my favorite! Definitely have to check out this shop! This may sound weird, because I love your swatches, but your pictures have actually inspired me to take more care of my hands. Yours always look so well cared for, I do my nails and I'm pretty good at it now, I also make sure my cuticles are done and well nourished, but the rest often gets forgotten. So that's my plan, put the work and effort in like you do, and have lovely hands as well as great nails! Couldn't agree more with this comment :) Chalkboard Nails was the first nail blog that hooked me into nail polish and nail art! The unicorn and the Clowning Around is so adorable together! Thanks for the giveaway! the leather nail polish is absolutely cool! So cute!! LOVE the unicorn (who doesn't?!) and I LOVE the green water color with the gold leaf - great combo! The unicorn one is my favorite! I just looked through the store...I think the weed charm is excellent :) I would totally rock a rasta mani using that...although it would be totally inappropriate at work. I love, love, love the bow and the unicorn. These manicures are so awesome!!! I'd really love to be a part of community where I can get responses from other experienced individuals that share the same interest. If you have any recommendations, please let me know. Thanks a lot! Late, but I love manicure one. How did you get the nail to texture? The polish itself is textured -- if you apply it without adding a topcoat it will create the texture on its own. I'm not sure -- I've never used them in gels! I would definitely get in touch with Hex though, I know one of the sisters gets them in gel a lot! She might have better insight than me. Hi Miriam! While I can say that the charm is curved, its effectiveness totally depends on the curve of your clients' nails. I would say that this one was a little less curved than some of the others, but you may be able to bend it more over a pencil or something if you get someone with super curvy nails. Everyone's nails are different so unfortunately I'm not able to give you a better answer than that!